cross itself. 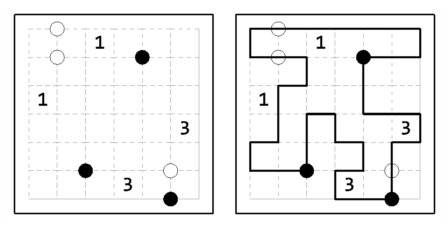 A digit in a cell indicate the amount of its edges used by loop.The circles in the diagram follow the Masyu-rules: The path must turn at every black circle, but cannot turn immediately before or after. And the path cannot turn at any white circle, but must turn immediately before and/or after.
. Also Prasanna published some in his blog with the second name. Bu yazı Instructions içinde yayınlandı. Kalıcı bağlantıyı yer imlerinize ekleyin.